LESTARI, Hesty Yulinda Purna and MAGNADI , Rizal Hari (2016) ANALISIS FAKTOR-FAKTOR YANG BERPENGARUH TERHADAP KEPUTUSAN NASABAH UNTUK MENGAMBIL PEMBIAYAAN PADA BMT AL HALIM TEMANGGUNG. Undergraduate thesis, Fakultas Ekonomika dan Bisnis. 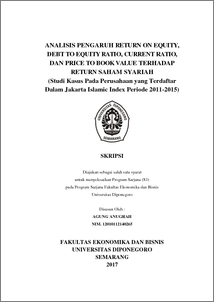 This study aimed to describe the influences of promotion, salesmanship, product knowledge, and word of mouth to the decision making on taking expenditure in BMT Al Halim Temanggung. Promotion, salesmanship, product knowledge, and word of mouth are used as independent variable and financing decision making as dependent variable. The sample of this research is customer of BMT Al Halim Temanggung by using technique purposive sampling. The data are collected from 86 costumers of BMT Al Halim Temanggung by using closed questions questionnaire. Then the data are analyzed by multiple linear regression on SPSS software. The regression result shows that the value of promotion is -0,043. It means that it has negative and not -significant effect. Salesmanship has a negative and significant effect with value of regression is -0,301. Product knowledge has a positive and not significant effect with the value of regression is 0,153, and the word of mouth has a negative and significant effect with value of regression – 0,215 toward financing decision making. According to this research, the financing decision making can be 9,3% explained by promotion, salesmanship, product knowledge, and word of mouth and the rest can be explained by other variables outside this research.